Munich - If Germany coach Joachim Löw still has any lingering doubts about who to include in his squad for the forthcoming FIFA World Cup, he could do a lot worse than following in the footsteps of bundesliga.com readers and selecting , who was voted as Matchday 33's Player of the Week. The versatile Borussia Dortmund midfielder put in another lung-busting, mesmerising shift to inspire the Westphalians to a 3-2 win over 1899 Hoffenheim on Saturday, and boost his own chances of boarding that plane to Brazil. With 61 per cent of the vote, there was no doubt Großkreutz struck a chord with the ever-growing legions of Bundesliga fans worldwide. The 25-year-old, who has filled practically every position on the field for club and country this season – except as goalkeeper – was also on target in Saturday's win, netting his 23rd Bundesliga goal, almost a year to the day since his last one. And what an effort it was. His curling, long-range effort sparked Dortmund back into life with Lukasz Piszczek and Henrikh Mkhitaryan swiftly following his lead. Großkreutz' engine never stopped and he covered practically every blade of grass at the Signal Iduna Park, sacrificing himself for his team, making him a worthy winner of our weekend vote. 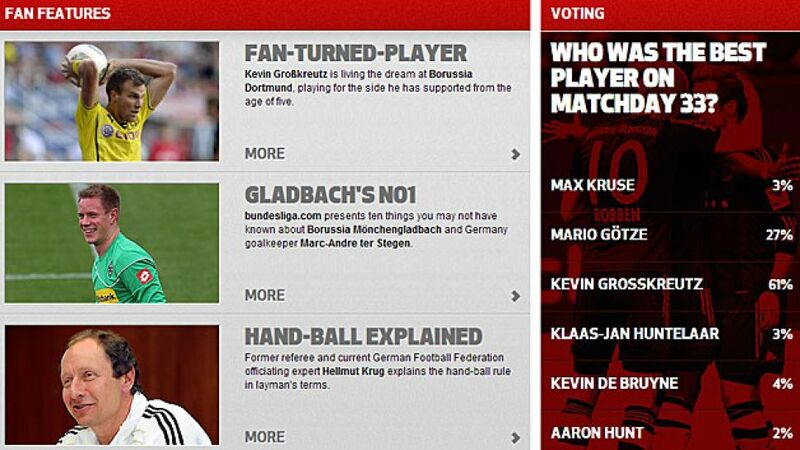 Meanwhile, scoring twice against Hamburger SV was not enough for Mario Götze to make a big enough impression on voters. He almost took a hat-trick, had it not been for a deflection off Thomas Müller for one of FC Bayern's goals in a comfortable 4-1 away victory. Götze, whose phone is likely to be ringing on Thursday morning when Löw issues his summons, took 27 per cent of the ballot. Behind the Bayern star, Kevin De Bruyne picked up four per cent for his stunning shot which helped VfL Wolfsburg to success in Stuttgart, while Max Kruse and Klaas-Jan Huntelaar each earned three per cent for goals which secured their sides the European football they were looking for. Finally, on an emotional day, Aaron Hunt managed to keep his feelings in check with a brace to help Werder Bremen overpower Hertha Berlin, earning him two per cent.